After playing around with so many girly looking projects, I decided it was time to do something a little more manly and rustic. 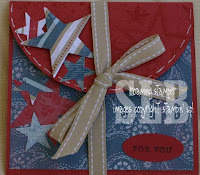 I did two versions of this card, I like one better than the other but I won't tell you which one. It's hard to tell from the picture but the large star has been scored to give it dimension. 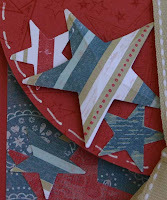 Two pop up glue dots are placed behind the star to give even more dimension. This was done on both cards. I like both cards but the second one is my favorite. I love the ribbon. What great details!! 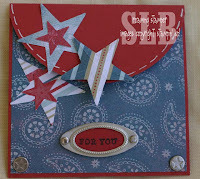 Love all the stars and the western look of these. I don't know how you manage to do all these projects and blog about them too but I am glad you do. I love these cards. I think my favorite is the first one because I think without the ribbon it makes it more "manly" and that is what you said you were going for.